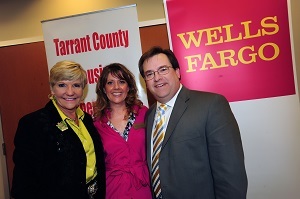 Tarrant County Housing Partnership was awarded $200,000 Priority Markets Grant from the Wells Fargo Housing Foundation. The grant program supports the stabilization and rebuilding of distressed neighborhoods, a key initiative for TCHP. The grant was one of 59 funded this year, with the total allocation nationwide coming in at about $6 million. The check was presented at the Hazel Harvey Peace Center for Neighborhoods during a ceremony celebrating the long-standing partnership between the two organizations. The agenda included remarks from TCHP leaders, local Wells Fargo executives, Tarrant County Development Director Patricia Ward and Fort Worth Mayor Betsy Price. Celestina Kubicki, a TCHP board member who has also benefited from TCHP services, offered remarks about the impact of TCHP's mission on the hard-working families served by the organization. “Our Dallas-Fort Worth team members are really pleased that we can continue to support Tarrant County Housing Partnership and the great work it does for affordable housing and neighborhood stabilization in Tarrant County,” said John Gavin, Wells Fargo’s regional president for community banking. “It’s hard to express in words our appreciation for the continued support of Wells Fargo,” said Donna VanNess, TCHP's president. “Their generous programs have been an important factor in our agency's success in revitalizing communities."